Weldon Burge, a native of Delaware, is a full-time editor, freelance writer, and publisher. His fiction has appeared in Suspense Magazine, Futures Mysterious Anthology Magazine, Grim Graffiti, The Edge: Tales of Suspense, Alienskin, Glassfire Magazine, and other magazines. His stories have also been adapted for podcast presentation by Drabblecast, and have appeared in various anthologies including Pellucid Lunacy: An Anthology of Psychological Horror, Don’t Tread on Me: Tales of Revenge and Retribution, Ghosts and Demons, Something at the Door: A Haunted Anthology, and most recently Beach Nights: Rehoboth Beach Reads. Weldon also frequently writes author interviews for Suspense Magazine. 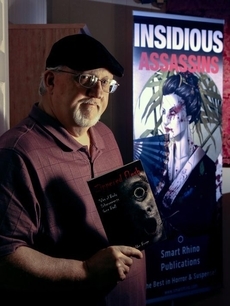 Starting in 2012, Weldon and his wife, Cindy, founded Smart Rhino Publications, an indie publisher focusing on horror and suspense/thriller books. The company has largely published anthologies (Zippered Flesh: Tales of Body Enhancements Gone Bad, Uncommon Assassins, Zippered Flesh 2: More Tales of Body Enhancements Gone Bad!, Insidious Assassins, and Someone Wicked: A Written Remains Anthology). Smart Rhino has a number of projects planned in the coming years, including Zippered Flesh 3; another collaboration with the Written Remains Writers Guild, A Plague of Shadows; and a third anthology in the ‘Assassins’ series. Weldon is also currently the Director of Publications and full-time editor for Independent School Management, which provides a wide range of products and services for private schools. Weldon has been the editor of Ideas & Perspectives, the company’s flagship publication, since 1993. He is also highly involved in the production of the company’s other publications. His nonfiction, primarily focused on gardening, has appeared in Organic Gardening, Horticulture, Fine Gardening, Gardening How-To, Birds & Blooms, Flower & Garden, National Gardening, Delaware Today, Country Discoveries, Grit, Back Home, The Almanac for Farmers & City Folk, and many other national magazines. You can follow his blog and his other endeavors on his website, weldonburge.com. Weldon's story, "Hearing Mildred," was published in Zippered Flesh, Tales of Body Enhancements Gone Bad! His story, "Welcome to the Food Chain," appeared in Uncommon Assassins. Five of his horror/suspense stories were published in the collection, Broken: Stories of Damaged Psyches. Weldon's hit man tale, "Right-Hand Man,' was included in Someone Wicked: A Written Remains Anthology. His story, "Vindictive," appeared in A Plague of Shadows: A Written Remains Anthology.